Apparently we have been in our house four years! It's hard to believe it has been that long as we are still working on making it our home. We purchased it knowing that it was in need of a lot of work, especially the external aspect of the house. This has taken most of our time and attention and money. We have finished most of the big jobs and repairs, like new cedar cladding, new decks, painting and staining. So we can now start to have some fun decorating the inside. Tip #1 - with house renovation always take care of the exterior first, fix all leaks and rotten materials. It is so important to weather proof a house before making it all beautiful on the inside. 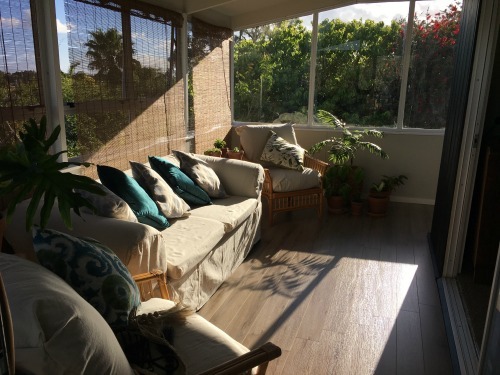 Our sunroom, being the room we spend a lot of time in, is really our favourite room in the house. Poor thing has been in a state of neglect for a while. So we bit the bullet and set to the mission of redecorating it. It is not a big room which from a decorating perspective is good, however it is very sunny and full of windows. We needed to think through the challenges that brings with decorating, like paint colour fabric fading etc. First things first, what do we want it to look like. This is where Pinterest is soooooo fantastic. 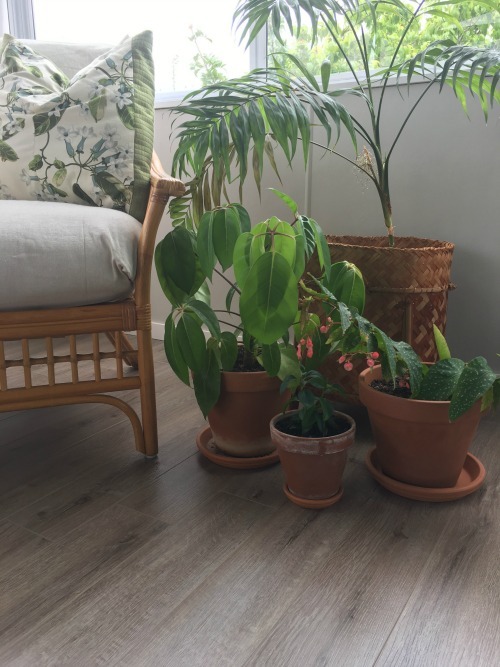 I set up a Sunroom board in my Pinterest account. (here is my Pinterest account). This really helped Pete and I to quickly narrow down the style we wanted and get some great decor ideas. In fact Pinterest is really helpful when working with your partners that struggle with concepts and visualising. You can just simply show them in Pinterest and they are like "ohh yeah that is so cool, I love that!" From here we worked through tone and colours and decided on a very neutral, linen look. The colour will come through in the greenery that will be in the plants, cushions and rug. To help decide on the actual paint colours we got some test pots from Resene . Tip #2 - number the colours on the sample cards and on the surface next to the sample colour so you always match them back up. Also test them on different parts of the room to see how they are in different lights and against an existing colour, if it will remain. We used a low sheen as it is a bright room and we wanted to reduce the glare and reflection. We used an existing semi- gloss white for the sills, that we had left over from a previous paint job. 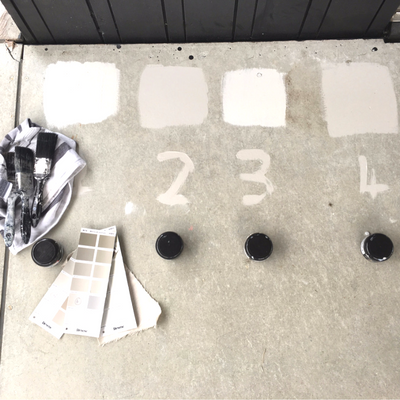 Tip# 3 - if you don't use all your paint, store the cans upside down to help prevent the paint drying out. The flooring option was easy as wanted to have a floating laminate floor. We had installed this option in my office about 6 months ago and just love it, perfect colour and look. 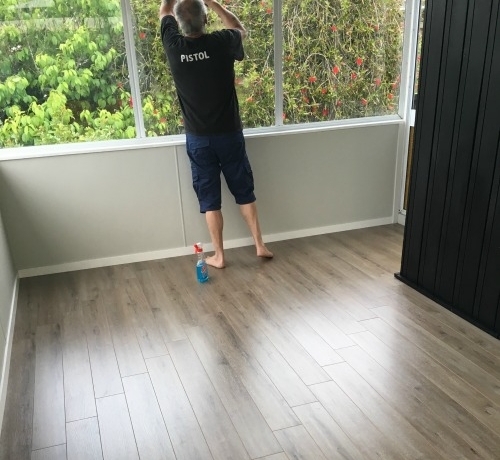 We used Hanwood Laminate flooring in Bleached Oak , which we got from Bunnings This also helped with the connection of rooms throughout the house. There is black cedar in the Sunroom so these colours really pop against the black. As we were undertaking the planning and organising of the Sunroom, I was also keeping an eye out for special little treasures that would fit into the new room decor. Pete and I are keen recyclers and we love to hunt through all the secondhand, thrift shops to find the perfect piece. For this room we picked up the two cane chairs for $25 each, the hanging baskets for 50cents each, the planter basket for $6 and the cushion for $4. Tip # 4 - focus on use, fit and style when secondhand and thrift shopping. It's only a treasure if it's going work well with your tastes and functionality. I always try and source secondhand first, so much better to reuse if you can. And there is the added bonus of it being very budget friendly. This is probably my least liked part, sanding and painting, I am sure Pete would agree too. However preparation is the key to a job well done. It always take longer than you plan for, even with time saving tools, you have to take your time to do it right. I think I got off lightly in this job as while Pete did all the sanding and painting I recovered the furniture. I will do a more detailed post about this as I used builders drop cloth to recover everything. It was the perfect material (heavy duty calico) for a sunroom and cost next to nothing to do, $88 for everything. We did lay the flooring together as it is really a two person job. As we have already laid a floating floor it did not take too long. When you do a floating floor for the first time, I would recommend watching a few online tutorials before tackling the job. The first couple of rows take a wee while but after that you are away. Tip # 5 - plan plenty of time to do the preparation, you will need it. Since finishing it we are now back in our beloved room, spending most of the weekend sitting in the sun. A bit like a cat really! !